Slant Magazine – Bill Weber review! The miracle of Lionel Rogosin’s apartheid drama Come Back, Africa isn’t that it’s a solid, affecting artifact of a cruel society, but that it exists at all. Time Out New York Review! After a recent conversation with Susan Weeks Coulter, chairwoman of the Global Film Initiative, whose Global Lens series is currently in full swing at MoMA before a cross-country tour, my mind—in a humanitarian, can-do state—wandered to recent cinema history. Where has cinema caused change to happen, to move the needle in the name of progress? When was the last time this occurred—not a polite discussion, but real social and political change? I found myself coming back to these prodding questions upon a recent viewing Lionel Rogosin’s second feature “Come Back, Africa” (1959). The film, which aesthetically works as a blend of pioneer documentarian Robert Flaherty and Italian neorealist Vittorio De Sica, exposes the jaw-dropping racism and social injustice that has victimized black South Africans under the apartheid government since its enactment in 1948…. Click here for rest of review. 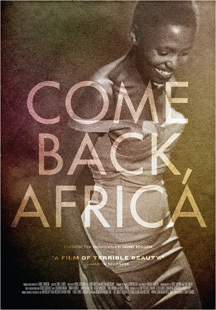 Milestone is very proud to announce the theatrical premiere of the restored COME BACK, AFRICA starting January 27, 2012 at New York’s Film Forum!